London based spatial designer Carlo Viscione proposed a design, in collaboration with Amy Harris, for an interactive installation, titled Flow, to be placed in Terminal 5 at Heathrow airport. Made up of 4,000 ‘pixels’ measuring 10 sq cm each with a discarded boarding pass ticket stub protruding from the center of each square, the responsive wall reacts to the movement of passers-by. 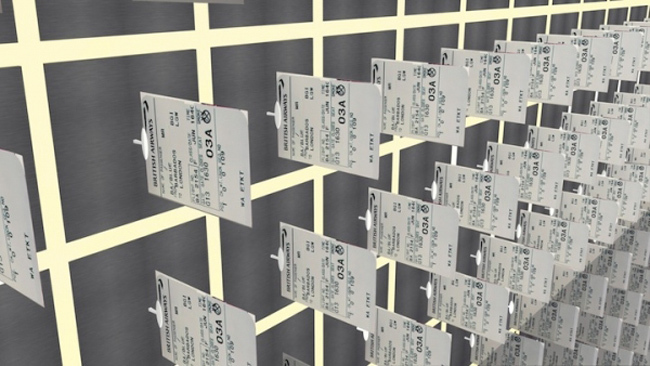 Triggered by ultra-sonic sensors hidden in the ceiling, the installation creates flowing motion by moving the ticket stubs in a synchronized movement across the wall. The idle state represents a coral reef movement; flow swinging softly left and right. When people are passing by, it reacts to speed, group size and proximity and tracks the people along the 20m length of the installation. The computer assessing the information triggers different algorithms that create different responses to the people passing – from a simple wave to repeating patterns. We hoped that this little intervention creates a little smile on people’s faces and creates an experience that positively links back to visiting London. Watch the video above for the full effect. And visit Carlo Viscione’s website to see more of his work.